with a computer made of PlayStation 2's. Perhaps the most striking aspect of the project, which uses the open source Linux operating system, is that the only hardware engineering involved was placing 70 of the individual game machines in a rack and plugging them together with a high-speed Hewlett-Packard network switch. The center's scientists bought 100 machines, but are holding 30 in reserve, possibly for high-resolution display application. so it's not an XServe rack running Pooch or Wolf clustering software, but it's nice to see another attempt to supersize computing performance out of commercially available gear. EDIT: Actually, I heard this before Sept. 11th, so it must have been 2000. Don´t think Sony (or especially MS if it becomes a trend) will be that happy for their unvoluntary sponsorship. I am wondering if this supercomputer dispite his half trillion calculation by seconde, is efficient in real applications. 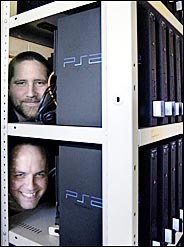 PS2 is a very specialized computer for video games. His chip his fast but very specialized. I doubt that this solution can beat real big computers. It looks for me, more like an experiment than a really good industrial product. it appears more a "proof of concept" than a practical cruncher (doesn't even make the top 500, although some XServe Clusters do. points for that, at least. The problem with the Gflop benchmarking is that, it does not show real performance with real applications (and not just with SETI or fractal demos). If it was the case, nobody will buy anymore supercomuter, but just big cluster monsters. The idea of using video game consoles is interesting because such consoles are often sold below cost by the manufacturers, who hope to make the money back on games. So technically, you're getting your hardware below cost, which doesn't happen with desktop computer gear.